Okay so I just wanted to start off by saying that this is genuinely my first post on here, and I hope I'm not breaking any rules if I post this image since I know how strongly some people think, more or less feel about seeing photos of dead kids, but this photograph personally struck a deep personal chord with me. I honestly am not sure if anyone on here has ever seen it before. Like I mentioned in the title, it is a historical picture taken during the notorious Armenian Genocide, which is definitely one of the most barbaric Genocides to ever occur not only throughout history, but also during the early 20th century since it claimed the lives of 1,500,000 people. 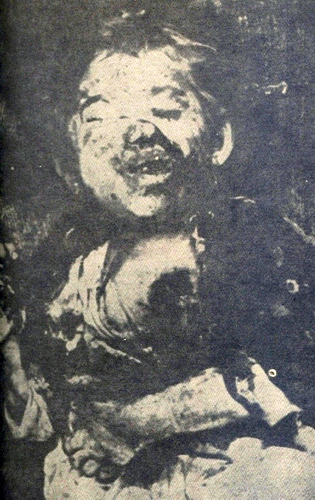 The only info I pretty much could find on the web about this image is this: A badly mutilated body of Croatian child no older than 10 from Kosutice, Serbian, Chetnik who literally had his heart ripped out with a hunting knife. Umm, so he was a serbian or a croatian or an armenian? You seem to have greatly missed the point, poor soul.